Turning the everyday into something extraordinary, Graham is the master of embracing a child’s view of the world. 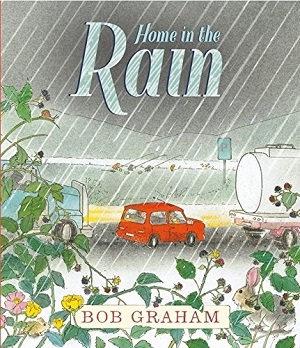 This wonderful little tale follows Francie and her mum as they drive home in torrential rain from Grandma’s house. The illustrations loop in and out of the car, as the reader sees the small red car jammed between lorries and oil-tankers on the highway, before zooming into the backseat with Francie, and then out into the countryside tucked away beyond the road, with the wildlife sheltering from the wet, and up into the air as a kestrel dives. Graham explores the sights, sounds and smells of the everyday – from an argument at an interchange, to the smell of farmyards, the squeaky sound as Francie writes on the steamed up car window, rainbow oil puddles, the noise of the radio, and finally into Francie’s imagination as she wonders what her new baby sister will be named when she’s born. The observational perspectives of the book pick out what’s familiar and what’s new, just like the coming of a new baby. 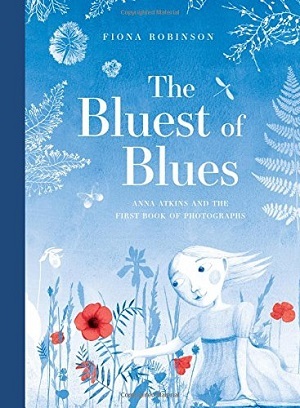 It’s an atmospheric book, empathetic, and both words and pictures express a softness that feels soothing – an ‘everything’s going to be alright’ tone. You can buy it here. 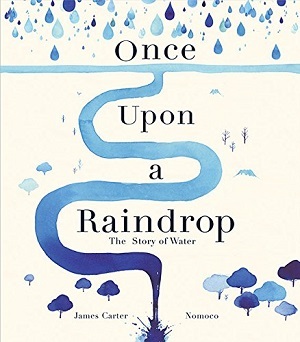 A book that takes an image of a small boy playing in his favourite pool on the mountainside, opens up to huge scope as it portrays Earth’s water cycle. Isaac sees clouds dark above him, the rain pours down into the pool creating streams that flow into the river near his house (beautifully cast on stilts). The book then follows the river into the sea. It is the ambition of the book that is so impressive. Baker-Smith conveys the cycle of water of course, explaining the ocean steaming into mist, but the magic lies within the water’s journey. He conveys how water adds to the environment, how humans, animals and vegetation interact with it across the globe and throughout time. Water is important and transient, both gentle and powerful. He shows the different ways in which water presents – its stillness in a jar of water, plunging waterfalls, laughing streams, meandering rivers, churning waves. Water is commodity, yet nature, utilitarian resource, yet something to be protected. Pure and simple in its magnitude. And all the while referring back to Isaac. Each page is an illustrative work of art, and the words ebb and flow like poetry. The use of light in the artworks is extraordinary – Isaac’s reflection in the water as he stands in the natural pool is haunting and wondrous. Not to be missed. Buy your copy here. This too is the story of water, but so utterly different in style. Nomoco’s abstract watercolour feels almost like the different types of water itself – sometimes looping down the pages in the form of water-carrying pipes, at others winding its way across the page like a river. There are droplets too – inkstains in circles across a page – and always accompanied by Carter’s poetry as he explores the facts of the matter in lyrics. Starting with the beginning of time, Carter tracks water on meteors that carry ice, all the way through to water’s uses today – keeping humans clean and healthy – as well as life’s overwhelming necessity for water. 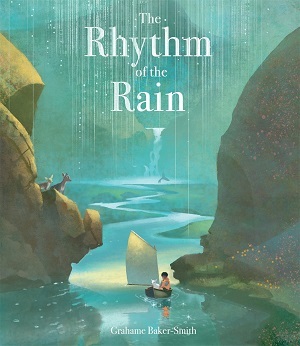 Because each page is so different from the next, both in form of poem and execution of illustration, it allows the reader to dissect the different formations of water and the different elements to it. Modern, fresh and impactful, this makes for a refreshing imbibing of information. Get wet here. 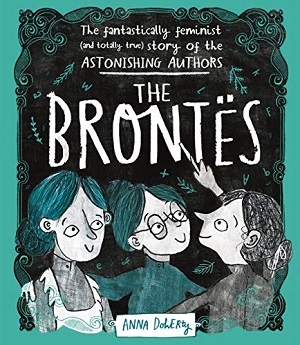 Whenever there’s a new topic at school, there’s a scramble from teachers and some pupils to find the library books that fit, the book that’s pitched correctly for the age group and touches on all the themes that the teacher wants to explore during that term. And rarely does a book match exactly. Probably because then it would be a textbook, rather than a book for exploring, a book for further stimulus and enquiry. 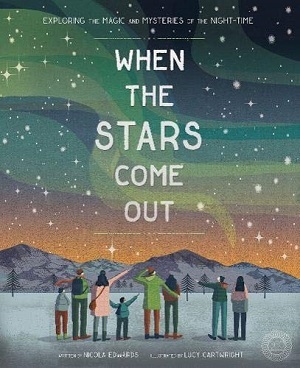 When the Stars Come Out by Nicola Edwards, illustrated by Lucy Cartwright, is a refreshing piece of nonfiction that not only ticks the boxes when exploring ‘Time and Place, Earth and Space’ for example, but it also neatly stretches the mind, and causes pause for thought, and elicits pleasure at the same time. Not just a space book, as the title might imply, When the Stars Come Out intends to explore our whole universe at night-time from the sciencey bits, such as why night occurs and the different constellations in the sky, but also the geographical element – both physical and human – and it also reaches right from the outer echelons of the universe into our very heads; what happens when we sleep? Diagrams and illustrations begin the story of how the night works, showing the rotation of the Earth in relation to the sun. Then, before the constellations are explored, there’s some history on stargazing, and some recognition of why some people are scared of the dark. The moon and stars are investigated, and then tangents of this, including auroras, moonbows and shooting stars. Coming down to earth, Edwards explores different landscapes at night, from the city to the desert, rainforests, mountains and many more including the sea, extrapolating which changes happen at night in the darkness. Animals are looked at in more detail in the next chapter, looking at sleep, dreams, nocturnal animals, and of course, humans. This chapter is particularly interesting as it’s rarely dealt with in children’s non-fiction. I liked the pie chart of sleep cycles, our natural rhythms, and then a look at super sleepers and world records, including the man who stayed awake for 11 days. It’s dangerous of course, as explained in the text, but fascinating information. Lastly, the book investigates extreme days and nights – near the Arctic and Antarctic Circles, as well as clever inventions such as glow in the dark cement and what scientists are working on in terms of night-time and day-time differences in plant growth, for example. The book ends with a glorious celebration of the night – from Diwali to Walpurgisnacht. This is a joyous and fascinating book. The illustrations are detailed and immersive – both conveying the science in the lunar cycle, but also a sense of wonder and mystery in dreams and night visitors. My only caveat is the size of the text against darkish backgrounds – not good for sleepy eyes – but perhaps the text’s smallness will keep the mind focussed and prevent daydreaming! The book is large in size but well designed to reflect the information inside. The mountains spread reads as portrait rather than landscape – mirroring mountains of course, but also giving the different levels of mountainous terrain – the birds, the climbers, the foothills. Other pages look like landscapes – the savannah for example, with its panel of night sky at the top, but then it’s land mass stretching towards the reader. The animals are illustrated in action – grazing or in motion, but the text is chunked nicely into individual paragraphs, many in their own colourful panels. The book is extremely visual – the colours subtle rather than garish, reflecting the muted light of night times. An exciting non-fiction title that illuminates the mysteries of our night-time and stimulates curious minds across a broad spectrum of inter-linking subjects. You can buy it here. It’s British Science Week, 8th to 17th March, and it’s delightful to see hands-on experimenting happening at school and at home. We are growing crystals in the kitchen, and dropping eggs in school, and I’m thankful that the experimenting is that way around. For other science experiments, a new book is making life very easy. 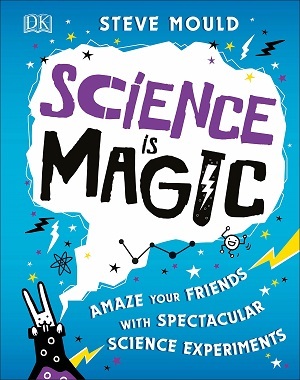 Science is Magic by Steve Mould is a science experiment book that uses everyday items. I don’t think there was a single item in the book that I needed to go out and purchase. Examples include a can of drink, a pack of cards, a measuring jug. Each experiment is fun and simple, and then leads onto explaining the science behind it. We looked at the ‘pepper-repelling finger’ and learned about surface tension, experimented with ‘colour-changing potions’ and learned about the amount of acid in liquids, and made ‘a drinks can jump’ whilst learning about forces. The reason it’s called magic – is because it aims to show things that appear to be magic, but can actually be explained by science. The tricks or experiments are easy to follow, but there are also pages on natural wonders that seem like magic, but can be explained, such as camouflage, erosion, and bio-luminescence. What’s more, there’s history too as Mould explains how certain tricks were performed in the past – how illusionist David Copperfield made the Statue of Liberty disappear in 1983, and many more. The layout is easy to follow with large pictures and typeface, not many of the experiments appear in previous science experiment books, and there’s a good glossary at the end. Experiment here. 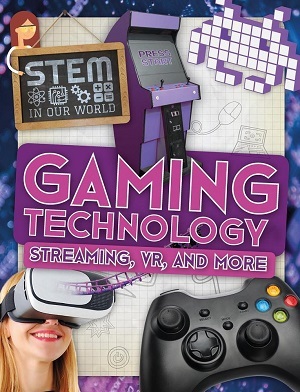 Gaming is a big part of the leisure industry and the book takes the reader through the history, accessible gaming for those with disabilities, and how the industry has advanced, with techniques from motion capture to VR and streaming. 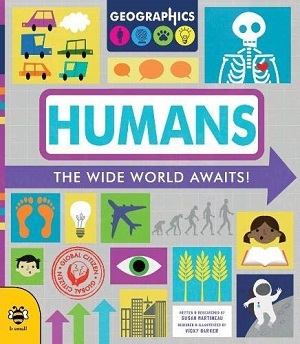 The book also suggests how gaming can be more than just leisure – helping to keep humans healthy and fit, and outlines ‘citizen science’ – exploring how games can help research into diseases, genetics and the environment, using examples such as ‘eyewire’ to explain how. Whale FM is another, in which players listen to clips of whale-song and match to other clips that sound the same. Players are helping scientists. 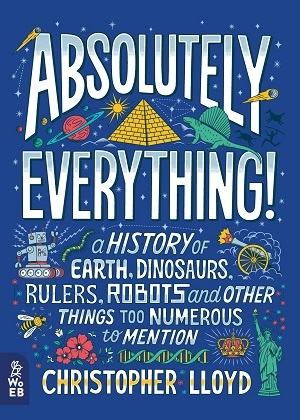 Of course books illuminating such up-to-the-minute technology will date, but for the moment this is a great nonfiction book for kids that guides learning and discussion on the topic. Designed for KS2 Science (aged 7-11), the layout is coherent and colourful – a good balance of large text and pictures; photographic, diagrammatic, and illustrative. Go gaming here. 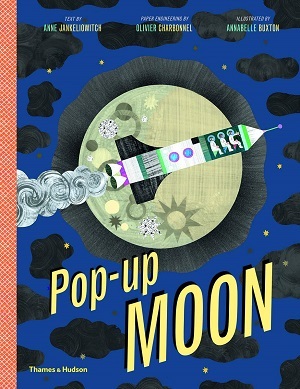 Staying with physics, but branching also into astronomy, is Pop-Up Moon by Anne Jankeliowitch, Olivier Charbonnel and Annabelle Buxton. This is a real feat of paper engineering, with pop-ups on every other page, which fold back down easily after many openings of the book, and aren’t so flimsy that the reader would be scared to touch. What’s more, each pop-up really works its science. The first is a graphic representation of the position of the Earth and Moon in relation to the Sun, and shows the phases over a month. This leads into a spread about the tides and some urban myths about the power of the moon. The next pop-up is the planets in orbit, cleverly done so that it stands up beautifully when the book is open. There is some good physics disseminated in later pages about light and shadow, and space exploration. Inspirational and informative, this is a good science book for Earth and Space topics. Fly to the moon here. With social media and children’s mental health dominating the airwaves this week in the UK, and statistics released that show, not only the rise in mental health problems among the young, but also a rise in suicide, it’s more and more important to be an active part in protecting and looking after children’s mental health. For me, books are an effective way through any difficulties, providing a de-stress just by reading, but also often having the content show a way forward, to promote empathy, and to calm a troubled mind. 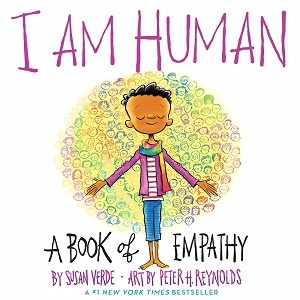 Here are three books to help a child navigate through, particularly pertinent in this Children’s Mental Health Week. Which child (or adult for that matter) hasn’t over-reacted to something? Perhaps using anger as a reflex when being told off, or experiencing heightened anxiety about an upcoming test that then manifests itself as an extreme emotion? Perhaps a toddler resorts to tantrums or being unkind to another child when things aren’t going their way. Professor Peters believes that one way of dealing with this is to control one’s inner chimp. Peters’ first book, The Chimp Paradox, sold over a million copies, but it was a self-help book aimed at adults. Now he’s brought his concept to a children’s book, illuminating how they too can train their inner chimp and learn life-changing habits. 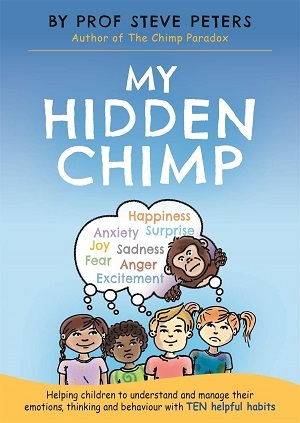 In My Hidden Chimp, Peters suggests that the brain contains two parts: the human rational side, and the irrational chimp side – the part that leaps to conclusions, acts rashly, causes your emotions to rocket, or for a child, makes them feel grumpy, worried, naughty etc. Written and illustrated in a simplistic comic book style, the book is an eye-opener for adult and child alike. It is also a workbook – so that the child works through the book using exercises rather than just reading and consuming. Peters aims to explain how to keep the chimp under control (although also, and very importantly, recognising those occasions when the chimp might be right – when it’s sending out danger signals). Moreover, he explains that the chimp is not a scapegoat for a child’s actions, nor an imaginary friend – this is a part of the brain for which the child is responsible and it’s about knowing when to tame it, and how to train it. For example, when confronted with something a child doesn’t want to do – one part of the brain will be accepting of this, the other part is the chimp who will get upset and grumpy. Peters argues that the child always has a choice of which side to be on. And then he gives ten tips for how to help manage the chimp, and choose the positive side – these include smiling, saying sorry, being kind, talking about feelings etc. And always with examples and exercises for how to do this. It sounds almost obvious, but can be really helpful to have everyday emotions and reactions managed in this way. 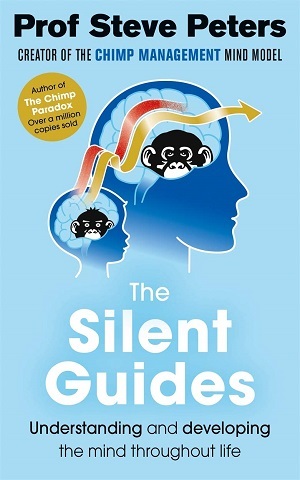 The accompanying book (although marketed as being the other way around with The Hidden Chimp as the companion title) is a hefty book called The Silent Guides, which is aimed at an adult audience, but particularly one that deals with children either in a parental or caring capacity. Peters’ writing style is easy-going and straightforward, and some of the guidance is fairly obvious. His conclusion too, is that the guidance won’t work for every child. But if you’re a fan of the basic concept, or want to learn some habits that will engender a change in irrational behaviours, then this is a good start. You can buy it here. A small pocket book (smaller than an ipad mini), with plenty of graphics, puzzles, and drawing space, this book aims to show how to live some of your life without your mobile phone. It’s a plea to go slow, to look around more, to avoid losing hours scrolling. While acknowledging a phone’s worth and pleasure, the author aims to show the reader how to unleash their creativity, feel better and escape from some of the negativity that the devices can promote, just for a little while. Seeing a real opportunity here, I sought Teenager One, who was on the sofa scrolling through something on his phone (head down, posture bad – this is another thing Vincent talks about). So I tossed him this book and asked him for his opinion. To be fair to Teenager One, I’m forever shoving books at him, so he has a high bar on which books grab him. This one did get an extended look in- although it was a step too far for him to dislodge himself from the sofa and find a pen to fill in some of the activities. But it did make him take some time away from the phone. So, full marks. In each section there are activities to engage the reader. 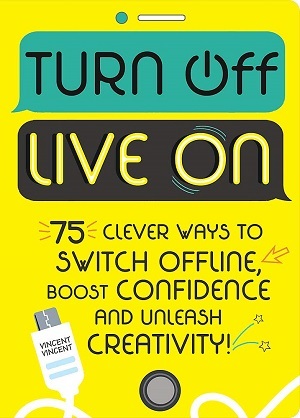 In the chapter on avoiding social media because of its ability to promote negative feelings, the book encourages self-awareness exercises, promoting self-belief and self-confidence, writing attributes about yourself and understanding what you like doing. The chapter on ‘train your brain’ aims to show how we defer to the phone too often, for example on finding somewhere on a map or not memorising phone numbers. There are code and map exercises to help. The book also contains exercises on mindfulness and relaxation, and quotes from current celebrities on positivity etc. Although I feel that many teens will greet the book with a fair amount of disdain if given to them by a parent when they’re on their phone (as I did! ), it could be a good tool to use for all the family to detox, and if slipped surreptitiously into a teen’s bedroom, may well hold some positive truths that they discover gradually. A good message nicely packaged (black and white illustrations/graphics throughout). You can buy it here. For the youngest member of the family, who may not yet be on their mobile phone, this fun picture book teaches a great lesson. That everyone makes mistakes, and what’s important is taking responsibility, saying sorry, learning from the error and moving on (and up!). 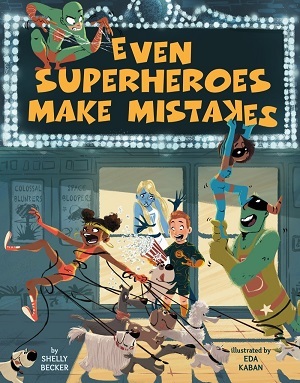 From the team behind Even Superheroes Have Bad Days, this is a fun rhyming tale about an array of superheroes who make errors but ‘own’ their mistakes. It’s very American in tone – the superheroes ‘goof up’ and ‘spiff up’ their hair, and some of their errors feel a little tenuous as if only there for the rhyme – they don’t clean their clothes, or get up on time, but the main thrust of the argument here is that they should ‘own’ their mistakes. The illustrations are great fun though – the superheroes based on ‘real’ ones, zooming through the air with capes a-flying, unleashing threads from their fingers, shooting lasers with their eyes – and making a mess of it. For this alone, it’ll be a winner with very young children who like their superheroes everywhere – even if they are teaching them good behaviours. But I think the rhyming was better in Even Superheroes Have Bad Days. Buy Even Superheroes Make Mistakes here. Today is Holocaust Memorial Day. So it’s fitting that in primary school library book club this week we were looking at the theme of diaries. My Y6 cohort embraced this with gusto, reading everything from The Wimpy Kid to Artichoke Hearts to Anne Frank’s Diary. Which brings us back to the Holocaust. They spent the first five minutes debating how old Anne Frank would be if she were alive today and where she might be living. It was a memorable and emotional discussion. Peter in Peril by Helen Bate is a graphic novel that aims to show how the people swept up in the Holocaust were ordinary people. This is a tame book for a young audience though, and doesn’t go into any detail on the camps or genocide, but instead illuminates the dangers and changes that one Jewish boy went through during the Second World War, hiding from the Nazi’s. Despite the fear and darkness, Peter is one of the lucky ones. 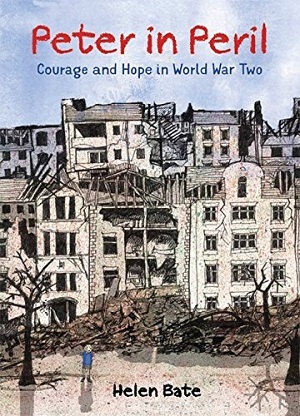 Perhaps why the book is subtitled: Courage and Hope in World War Two. The story is written in first person by Peter, a young boy living in Budapest, who loves football and cake. Like Anne Frank, he too is forced into hiding, but unlike most Jewish people, he is reunited with his parents and his former home by the end of the war. Because it is told from a young person’s perspective, there is an ignorance to what is actually happening around him – but from the action the reader will understand that Peter survived round-ups of Jewish people by moving hiding places several times, the only constant being a colouring book; he frequently faces hunger and cold. 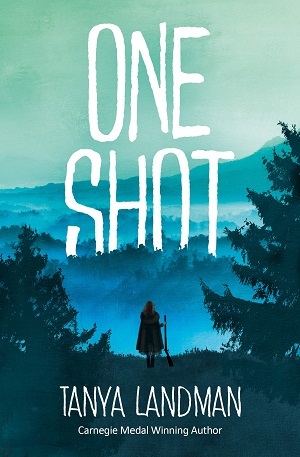 Despite the removal of the more harrowing elements of the Holocaust, the reader will understand that this was a horrific time, challenging and frightening for even the luckiest child. 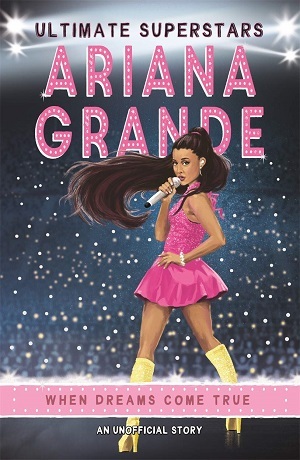 The novel is in graphic novel/comic book style, which makes it very easy to follow for the most reluctant reader; in fact the book’s pictures working best when they aren’t annotated with incidental dialogue. This is a true story, and the background of what happened in Budapest during the war is given at the back, as well as a summation of what happened to the real Peter. Many of Peter’s extended family were killed in the death camps, although miraculously he and his parents and baby brother survived and continued to live in Hungary. My only wish is that the figures involved in deportation were explained. In March 1944, there were more than 800,000 Jews living in Hungary (as a result of annexations from Slovakia, Romania and Yugoslavia). In May 1944 deportations began and in just eight weeks, 424,000 Jews were deported to Auschwitz-Birkenau. (Yad Vashem statistics). You can buy a copy of Peter in Peril here. There are fewer and fewer survivors of the Holocaust now living, and it’s important to hear their accounts. 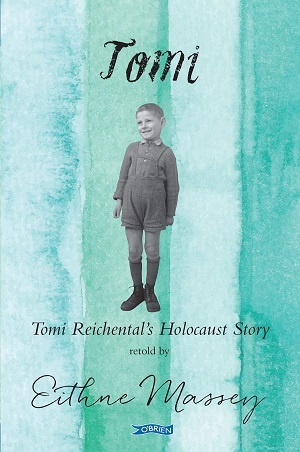 Tomi Reichental’s Holocaust Story has been retold by Eithne Massey for young readers age 10+. Tomi describes Tomi’s life in Slovakia, at first pretty idyllic, but then it deteriorates rapidly, firstly because of the taunting Anti-semitism from schoolmates, and then from restrictive laws passed forbidding Jewish people to go to school. Then the arrests start, and finally Tomi is captured and sent to Bergen-Belsen. Amazingly, Tomi survived, (although 35 members of his extended family were killed). As above, this is told through the eyes of a child, and so shies away from the absolute horror of Bergen-Belsen, but is still a devastating read, (much more so than Peter in Peril) although Tomi is appropriate for children, in that it explains the Holocaust in a powerful yet simple way. Told in narrative format, novel-like in its prose, yet with a slight distance to protect the reader, the book describes graphic events – the death in the carriage on route to the camps, the whips of the guards, death and disease within the camps. There’s a clear balance needed between explaining the truth of what happened – even to young children during the Holocaust – and protecting today’s children from nightmares and fear. And yet, there is also a duty to make sure we and our children ‘never forget’. In a time of rising anti-Semitism again, it is crucial that these true accounts are shared widely, absorbed, and lessons learnt. As Tomi says “I realised that, as one of the last witnesses, I must speak out. I owe it to the victims that their memory is not forgotten.’ We owe it to Tomi to read and understand his story. You can buy Tomi here. Research seems to indicate that children who have a strong family narrative, who are in touch with their roots, have better emotional health. Knowledge of this ancestral past seems to give children a grounding, a sense of control, and an ability to understand how their family functions. (Fivush and Duke, Emory U, Atlanta). 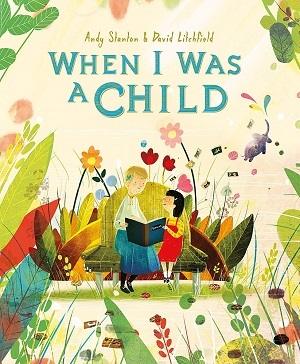 I’ve written about this before when reviewing books that allow a child to explore their own family history, learning their genealogy but also understanding the environment in which their parents, and grandparents, and ancestors grew up. The combination of nature and nurture. But what about if you could find out about a famous person’s family tree? What further insights could it give you to that person? Perhaps they were an only child, or had a famous parent, or an influential cousin? This fascinating, and rather beautiful book, aims to show some of the history and nature and nurture of famous individuals. These are biographies conveyed in a unique way, and of course the attraction of laying out each personality within their family tree also gives the book its own pretty aesthetic. 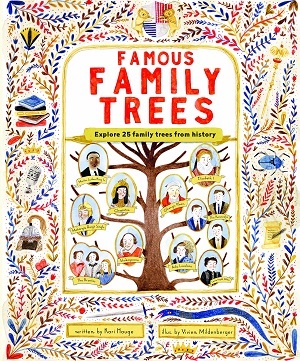 There are over 30 family trees portrayed in the book, including the Brontes, Shakespeare and Ghengis Khan, as the book explores both famous and infamous lives. The family trees not only explore the relatives or ancestry, and in some cases descendants of the person, but also the time in which they lived, the history and circumstances. Depending on the person, the family tree highlights different branches. So for example, Mozart is shown in relation to his parents and siblings, and yet his wife’s family is also portrayed – with parents and siblings. Abraham Lincoln is shown only within the context of his own family, from his grandparents to his last direct descendant. The authors of the book have been clever here, showing the reader the most interesting lives and stories within each family. Every famous person is afforded a couple of paragraphs about themselves as well, and also background to the time in which they lived and other small details. In the crowded pages about Charles Dickens, the reader learns about his family, but also how his books were published as instalments in newspapers, the debtors’ prison, and much more. 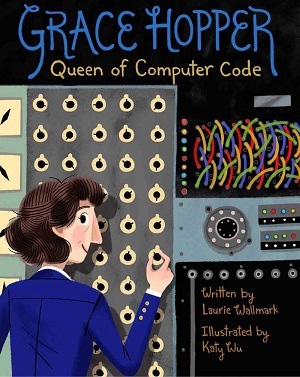 Ada Lovelace’s complicated family history is extrapolated in the ways in which Byron was associated with so many of her relatives, but the page also explores the influence of Ada’s mother and grandmother on her, and side details on the analytical engine. Anyone who’s ever attempted to draw their own family tree will recognise how difficult it is to lay it out, and how complicated it can get. Mildenberger does a fine job of fitting the complex relationships onto a page without it ever feeling too squashy – despite the number of children people tended to have many years ago! Each character isn’t just named, but is drawn as a small portrait, and this itself is fascinating – including hairstyles, hats and clothes. The illustrations feel folksy and old-worldly and the illustrator is particularly adept at making each family look distinct, but the characters within one family share similar traits. Clever and humorous. For those who aren’t familiar with family trees, there is an introductory spread on how family trees work and the symbols. The book includes profiles on Mary Shelley, Queen Elizabeth I, Mahatma Ghandi, Nelson Mandela, William Shakespeare, Catherine the Great, Maharaja Ranjit Singh and many more. A fascinating way to look at biographies. You can buy it here. There’s a wintry feel with this delightful picture book about unlikely friendship, and patience. 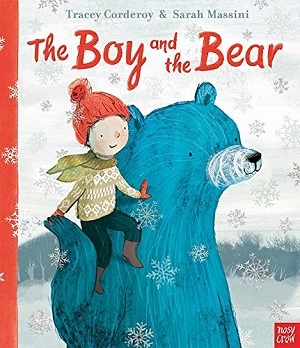 With glowing silver snowflakes on the cover, and a boy in a woolly hat holding hands with an adorable bear, the book gives a warm fuzzy feeling from the start. The story has an old-fashioned timeless feel, the boy running in the countryside flying a paper aeroplane with satchel swinging from his hip. There is not a screen in sight. Nor a friend either. But there is a shy bear. Although seemingly incompatible (in the most adorable ways), the pair strike a friendship, which has to take a hiatus for hibernation. The matching of text to illustration strikes perfection here. There is humour, pathos, a conveyance of the passing of time, and so much emotion. I suggested this for the very young, but if you’re young at heart, you’ll love this too. An absolute gem of a picturebook. You can buy it here. 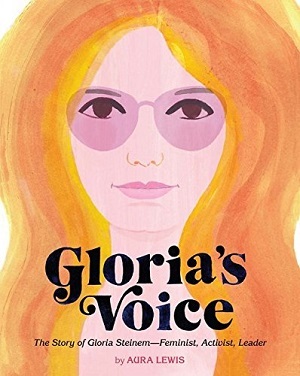 This glittery pink full length comic strip novel tells a cute story in simple sharp lines, with jokes a-plenty, and will enthral youngsters with its tale of Phoebe and her vain mythical animal companion. Phoebe skips a rock across a pond and accidentally hits a unicorn in the face. The unicorn, until then completely absorbed in its own reflection, is thankful for the distraction and grants Phoebe a wish. She wishes for the unicorn, Marigold Heavenly Nostrils, to be her obligatory best friend. And thus the adventures begin. As you’ve noticed from the name of the unicorn, there’s more than a hint of mischief here, but the book also bears a special message about overcoming loneliness and finding one’s own strengths and virtues. This is a lot of fun, and because the comic strip maintains focus on the key characters rather than deviating too much into the landscape, and the strips are self-contained, the story is easy to follow for reluctant readers. 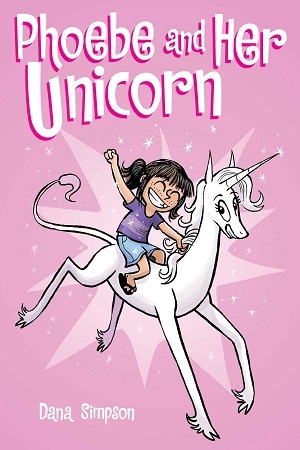 The newest full length comic strip title is Phoebe and Her Unicorn in Unicorn Theater. Sweet and sugary, and reminiscent of My Little Pony with a bit of attitude, this is a US title now available here. This isn’t a usual picture book. 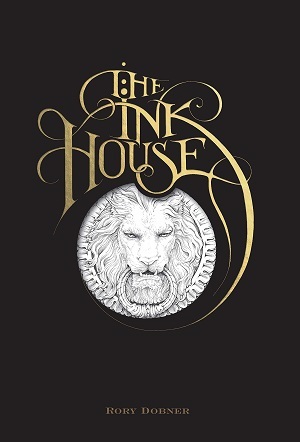 More a unique curiosity through the artist’s mind as he seeks to explore the insides of The Ink House, an intricately designed mansion built on a pool of ink, in which a party of animals is due to take place, after the human resident takes off in a hot air balloon to search for further knickknacks to add to his treasured collection. The illustrations, in ink of course, are amazingly detailed and stunningly imagined. There’s a darkness, a gothic tendency in the drawings, and the feeling is that each stroke is penned as delicately as if he were crafting a poem. The story isn’t really a story – just a menagerie of animals within a setting, and the scenes in which Dobner showcases the house in most detail work best. The mouse on the desk with piles of books, clocks, candle, quill pen; the ape in armchair with guitar, old-fashioned tea set, and gramophone showcases the neat juxtaposition between old and new, distorting one’s expectations and reality; the horses in the tiled hallway complete with pillars and a view onto the gardens. 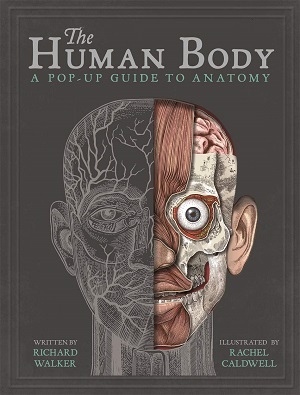 The artwork is disturbing, disjointed and wonderful, justifying the purchase even if the text is a little clunky. My advice – add your own words to the pictures, and tell the story in your head. You can buy it here. The author of this conversational tome is nothing if not ambitious. The contents of this nonfiction narrative span from the Big Bang through dinosaurs, homo sapiens, ancient civilisations, the classical empires to the medieval, age of exploration, revolutions, wars and onwards. Everything in fact. The tone is avuncular, as if you’ve asked a favourite relative to let loose – tell me about the ancient Greeks, Chris…In this chapter, Lloyd starts with an anecdote about an olive, which merges into why olive oil was so precious, then onto slaves, democracy and war…you can see how the narrative flows from one idea to another, incorporating facts, events and stories. Each section is colour-coded for easy reference and there are colour visuals throughout, from illustrations adorning the text to photos, maps, timelines etc. There’s a nice linear progression to the book, an understanding of how one thing in history leads to another (although this is definitely Western civilisation’s history), and an over-riding infectious enthusiasm to explore how societies linked up, how the world became global. Engrossing and all-encompassing. Give as a gift, and keep a copy for yourself. The sort of book to stop you getting bored in the holidays. You can buy it here. When I was in primary school we had to memorise the countries and capital cities of South America. For a long time many of these were retained in my memory, and even now I’m better at that continent’s geography than Europe. What’s even worse, to my shame, is my lack of knowledge about the geography of my own country, the United Kingdom. And as I watch my children go through school, I realise that it’s something that just isn’t taught. Thankfully, one of them can pinpoint where cities are situated (this is because he knows them from their football clubs), but we are all clueless about counties. All that’s about to change. Maps of the United Kingdom does exactly what it says on the cover, and although the illustrations seem at first glance to be fairly random – a red post box planted between Devon and Somerset, a hedgehog somewhere between Perth and Kinross and the Highlands – there is both enthusiasm and geographical symbolism behind the illustrations, and the drawings are actually an excellent visual guide to help readers learn and memorise the counties and cities of the United Kingdom. Divided, as to be expected, between England, Northern Ireland, Scotland and Wales, and then further delineated by county lines – either featuring one large county or several smaller ones – the full page spreads show the geographical placement of the area, and then proceeds to illustrate history, nature, people and scientific breakthroughs originating in the region. The information chosen is specific and well-written, but in such a way that it shouldn’t date. This is both clever and interesting. Lancashire focusses firstly on Blackpool, illustrated by its tower, but then pulls away to showcase the mill towns and the countryside. Local food plays its part, as does sport, highlighting Lancashire County Cricket Club on the map, but then also drawing a portrait of Andrew Flintoff as one of the regional biographies. Other Lancashire biographies include current personalities such as Brian Cox, but also historical activists such as Edith Rigby. There is information about wildlife and history and suggestions of places to visit to learn more, (the Pendle Witch trials at the Pendle Heritage Centre). 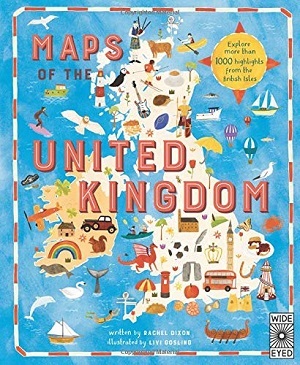 For ease of use, each page has the entire map of the UK in one corner with the focus place shown by its county border. All this means that as well as learning the geography, there is an abundance of trivia to absorb, and seven biographies on each page. Each map is colourful too – a different colour for each county as a background and full colour illustrations laid over the top. The small illustrations are intricate and distinctive, so that the reader can smile at the hands raised by the children on the theme park rollercoaster in Derbyshire, but also see the details in the clothing worn by Elizabeth Gaskell. The buildings too are distinctive – the Pierhead Building in Cardiff with its clock tower to the romantic ruins of Tintern Abbey in The Valleys. Written by a travel writer, this is an excellent classroom and home resource, a smashing Christmas present, and suitable for all from about 6 years. You can buy it here.